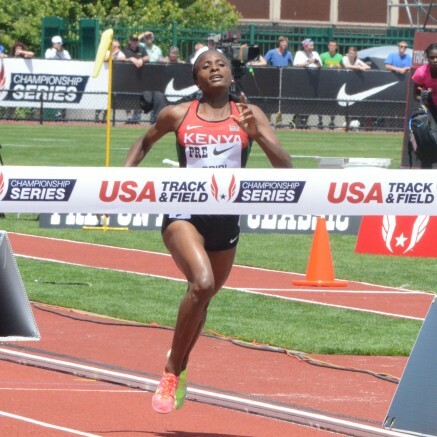 Obiri wins in a new PB! The famous Hayward Field, Oregon played host to the latest IAAF Diamond League meeting and witnessed some great performances from PACE athletes. Hellen Obiri (KEN) was a convincing winner of the 1500 metres as with a devastating last lap of 61 seconds she hit the front and then moved away from the field to cross the line in a new PB, Meeting Record and US Al-Comers Record of 3:58.58. Also in PB form was Bethwel Birgen (KEN) who took 1/100th of a second of his previous best when finishing 5th in the Bowerman Mile in 3:50.42. Matthew Centrowitz (USA) ran an outdoor PB of 3:51.79 for 10th. Double Olympic Champion Mo Farah (GBR) had to settle for 2nd on this occasion losing out in a sprint finish to Edwin Soi (KEN) in the 5000m. Galen Rupp (USA) was 6th. Andrew Osagie (GBR) had another consistent performance finishing 5th in a high-quality 800m. Winnie Chebet (KEN) was 8th in the women’s event. Linet Masai (KEN) opened her 2013 outdoor campaign by finishing 8th in the women’s 5000m. The previous evening in the 10,000m Emmanuel Bett (KEN) finished 9th and making his Diamond League debut, Timothy Toroitich (UGA) was 10th. Although renowned for its distance running, the Prefontaine meeting also served up some strong sprint contests. Olympic silver medalist Christine Ohuruogu (GBR) was 4th in the 400m, Perri Shakes-Drayton (GBR) 7th in the 400m Hurdles and Kemar Bailey-Cole (JAM) 8th in the 100m.